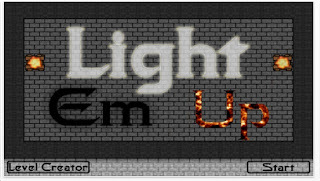 Light Em Up has 155 levels. 25 are free. I've done all the free levels and am working my way through the paid ones. Definitely a winner. Did I mention that Light Em Up is a free puzzle app game? 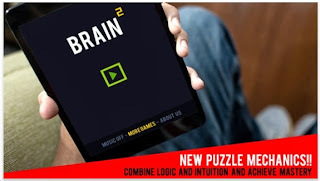 BrainSquare is a free puzzle app game. The object is to line up red squares to connect the red dots. Then do the same for white dots and yellow dots. 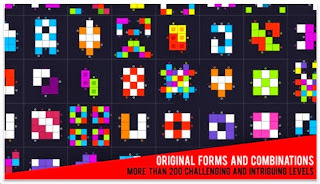 There are 20 free levels and I've solved them all. But I don't truly understand the mechanics/rules. The graphics are definitely slick. I think I'm going to redo them to get a better feel. Visionaries 777 recently contacted me about his new puzzle app game Dice Jockey. There are 4 distinct games. In the Puzzle category I did all 20 levels. The object is to roll the cubes around until they match on top. I was a little lost at first, not understanding why my 3 dice which all had 4 on top and were next to each other didn't work. Here's the deal: when you have 3 dice on the board, you must get them all to be 3. Logical right? To make things a little easier, 1 on top acts as a wild card. As I said, I solved all 20 levels. 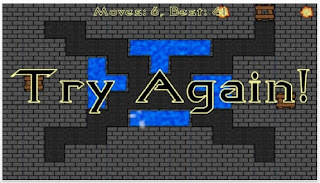 But I did not solve them in the minimum # of moves. I'm wondering.....if the minimum number of moves involves a wild card. 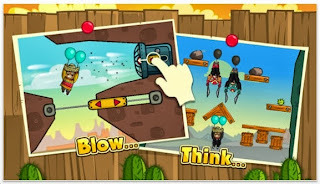 The other games require you to think and roll rapidly. 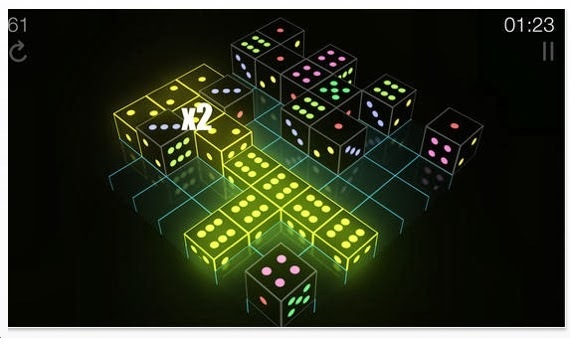 Clear the board of matching dice while more dice are added to the board randomly. If you've been following this puzzle app blog, you know I'm not into timed puzzles. Nevertheless, this survival/time puzzle element is cool. Look at the last image. See the six 6's? They have matched. They do not disappear right away. Instead, they slowly sink into oblivion and nothing can be rolled on that area for a while. Hurry up! 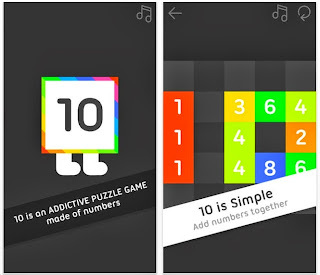 10 comes from http://www.iojoe.com/10/ The object is to slide the tiles to add up to 10. Pretty simple right? When a block becomes 10 - it stays put. 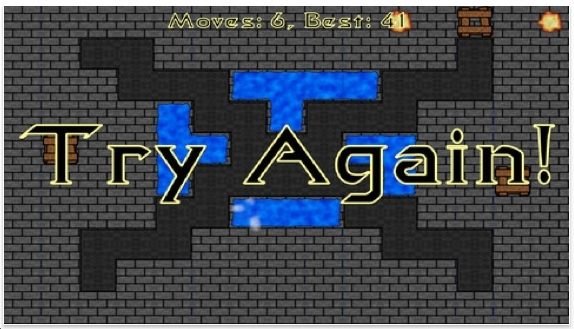 Blocks slide until they hit a wall, or a 10 block or crash into another number and merge. A 5 cannot crash into an 8. But if a 5 crashes into a 4, it becomes a 9. This is problematic when you've got a 1 that must merge with a 9 in another sector. I was not expecting much from 10. However, I am much impressed. 10 from iojoe is challenging and fun. There are some 140 puzzle levels. Right now I've done about 100 of them. It's a winner. And it's free too! At least for now. So hurry up and download it. The graphics are good too. this blog is about to get its 400,000 visitor. If it's you, take a screen shot and send me the image with your mailing address. I'll send you a prize. Oh, I got about 25 emails from people who noticed that I changed my profile pic. 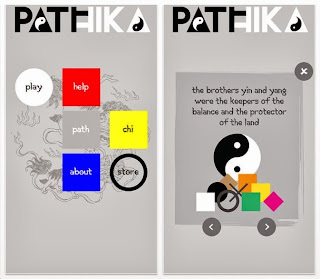 Sercan Şengün recently contacted me from Turkey about his new free puzzle app game Pathika. See the yin/yang image? It has nothing to do with the puzzle. Pathika is a maze/topology/color-mixing puzzle game. Look at the third image. See the white circle with the black dot? You must get it into the red circle. You must travel over every space. (Unless it's a black square - see the 4th image.) Gray squares must be crossed twice. Step on a yellow square, and you turn yellow. If you cross into a blank square with a white border - your color goes back to white. See the diamonds? Those are teleporters. Look at the last image. See the blue/yellow square? When you first land on it, your man will turn blue. The second landing - you turn yellow. 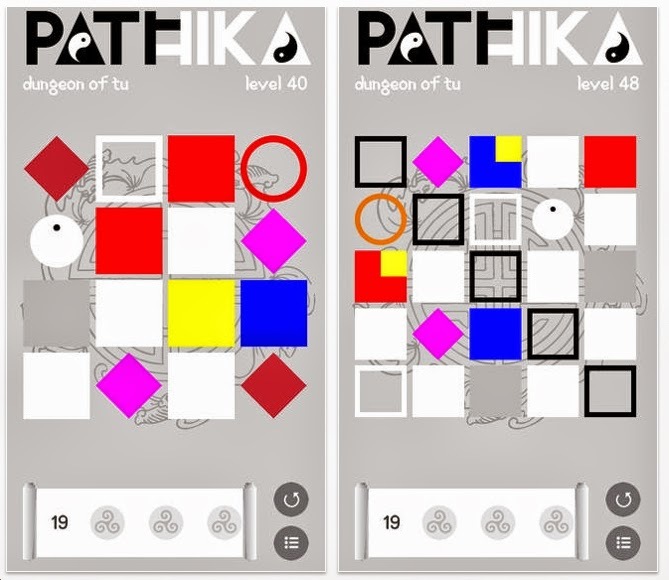 Pathika has 50 free levels. I solved them all in about 45 minutes. Keep in mind, I've done thousands of topology puzzles over the years. There are some level packs if you wish to continue. 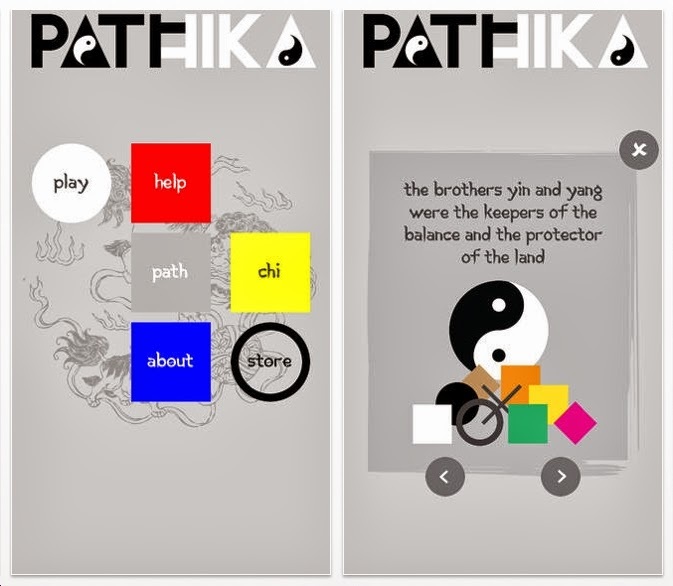 Pathika is fun, innovative and very well done. You should definitely give it a chance. 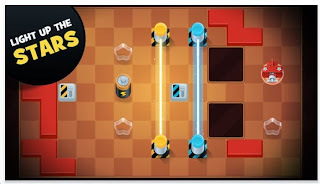 Ben from http://topapplabs.com/TAL_HOME_PAGE/TalHomePage.html recently contacted me about their new game Tip Tap Overlap. Objective: look at the bronze square. 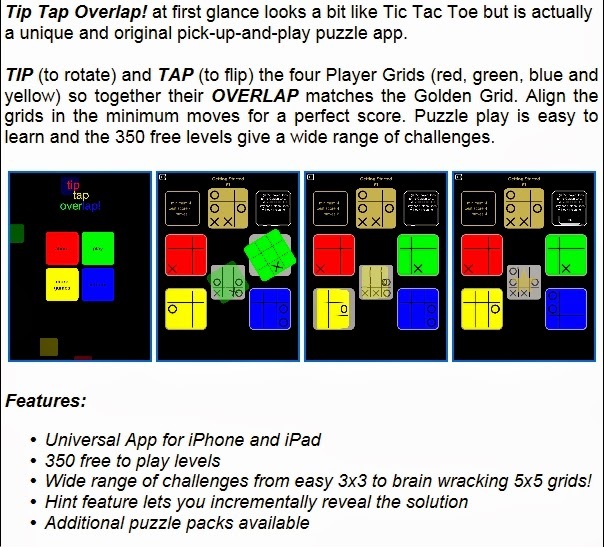 You must rotate and flip the red, blue, green & yellow squares to match the pattern in the bronze square. The gray square keeps track of where your symbols are at the moment. 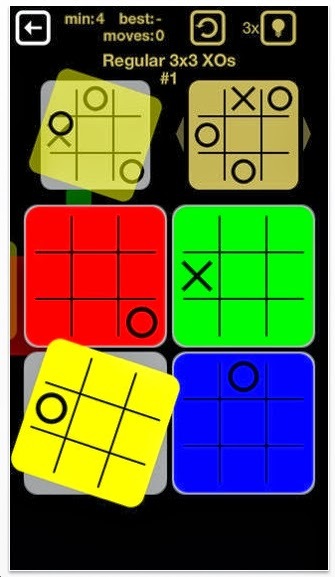 Tip Tap Overlap has grid sizes of 3x3, 4x4 and 5x5. 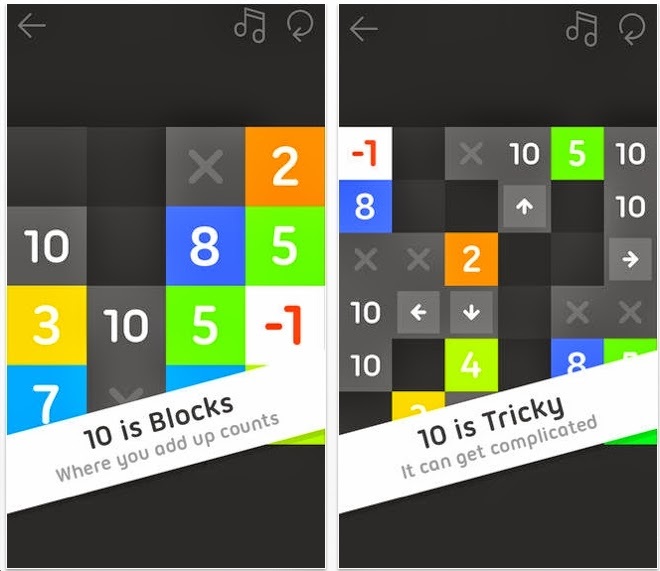 The 3x3's are easy but perfect for young puzzlers. I've done 14 out of the 50 available. There are 150 4x4s: I did 1 of them. The 5x5's are naturally the hardest. Of the 150 levels, I've done 39 of them, including the last (and presumably the hardest) 8 levels. They're not too hard. I spent just a couple of minutes on each. I did get stuck - but mildly. Why? Because one tile might appear to have 2 correct orientations. Tip Tap Overlap has good graphics. It's presented very well. 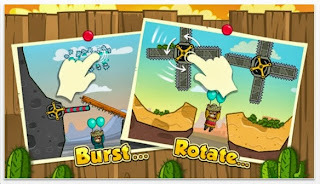 And I think you should give it a try because it's so different from other puzzle apps out there. 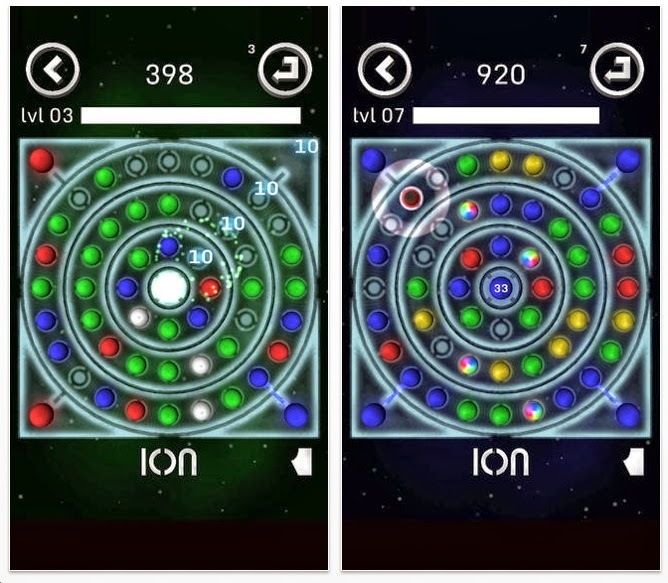 Ion is a free puzzle app game that's kind of interesting. The object is to stay alive by lining up colored discs from any corner to the center. You do this by rotating discs. 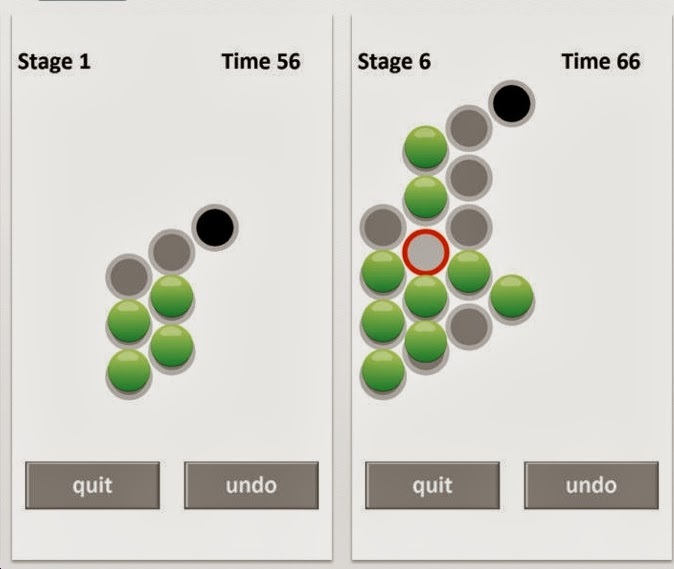 After each rotation, more colored balls are randomly generated. You lose when the board fills up. I played this for about 30 minutes and did not lose. 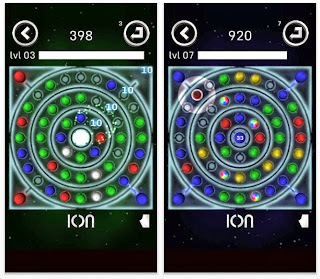 Ion is an interesting puzzle game, but it's too easy. Let me know how you like it. 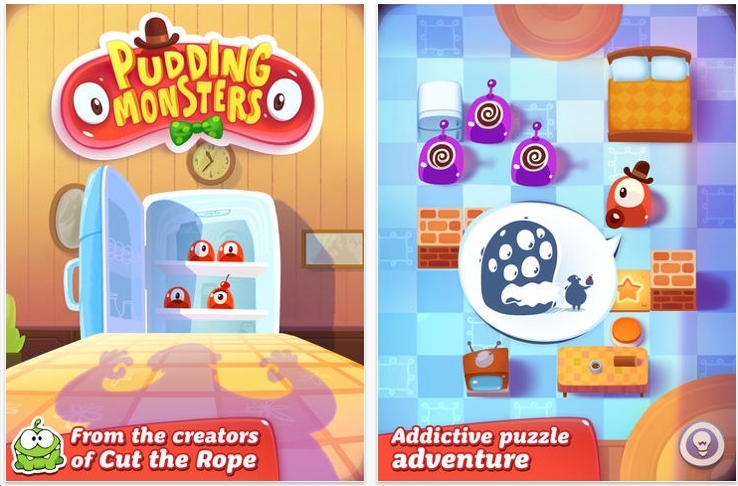 Pudding Monsters is a puzzle app game from the makers of Cut The Rope. The object is to slide the little monsters to create one big blob monster. When you slide them up, they will slide until they hit an obstacle. If no obstacle exists, game over. Ideally, your big blob monster will cover the 3 Xs. 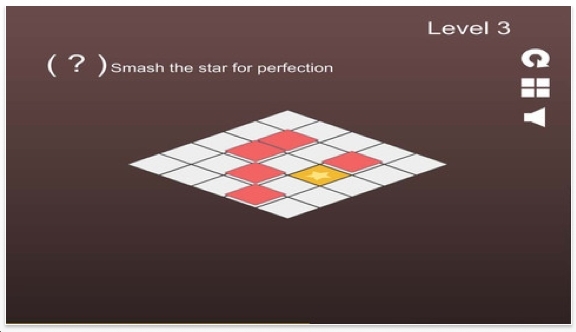 If not, you still get credit for solving the level, you just won't get many stars. And that's the problem with this type of puzzle: there are too many multiple solutions. There are 125 levels. I've done 52 of them. I imagine that they're going to get tougher. But I am not feeling the vibe. 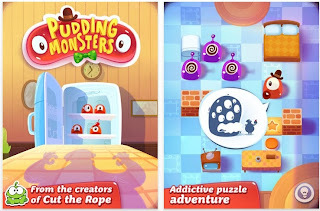 Nevertheless, Pudding Monsters does have some interesting puzzling elements. After a certain number of levels has been finished (can’t remember how many offhand) a second level of challenge opens up. 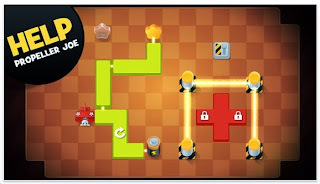 As you pointed out, with many of the earlier levels (and quite a few of the later ones too) there are numerous solutions, and that you can get through without getting 3 x “X”. It is obvious that in some cases it is possible to find a solution with 0, 1, 2 and 3 Xs. Once you get to a certain point, you can go back and do all the levels, and if you manage to find _all_ of the possibilities (i.e. 0, 1, 2, and 3 Xs, or fewer if it is not possible), then you get a Crown for that level… This is a lot tougher…! I still don’t have crowns for all the levels (from memory I think I am missing about 5…). Adds another dimension….! 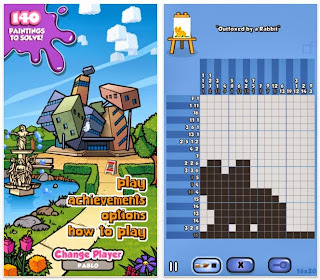 About a month ago Edward Brown from http://casuallabs.com/wp/?page_id=24 contacted me about his new free puzzle app game called Paint It Back. He sent me a promo code for the demo version, so I've been playing it a while. If you're a puzzler, you've probably seen this type of puzzle many times. The first 30 paintings are free, then you can download the level packs. There are some very good features about Paint It Back. 1. 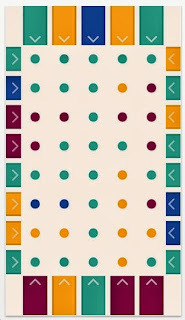 When you are swiping a row or column with paint - the graphics are very cool. Download it just to check that out. 2. Some paintings can be done at a 'normal' level or 'pro' level. So you get to choose the difficulty. 3. By far my favorite feature is the ability to sync your progress over different devices. This has been a sore point for me when I converted from the ipod touch to the ipad. All my progress on so many games was basically gone. Right now I've solved about 25 paintings. 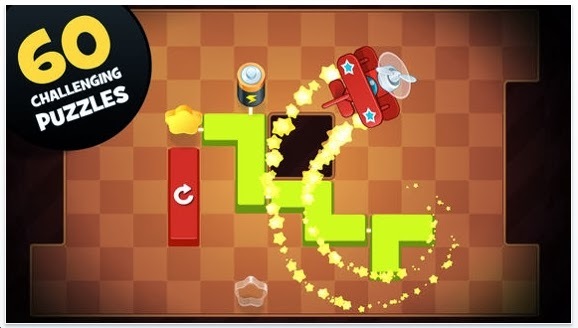 Blinky's Escape seems like a fun, old-school type of puzzle game. 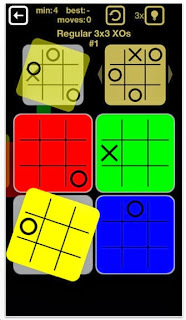 Tap the green squares away to let the yellow squares fall down. Help Blinky escape to the exit. 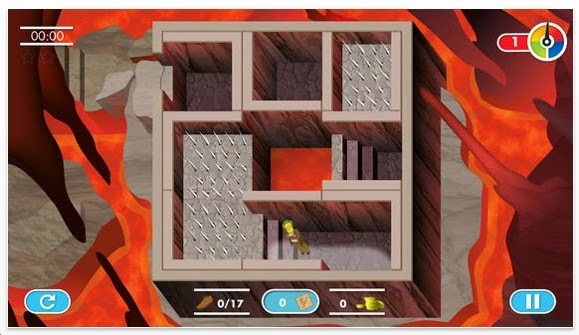 There are 16 levels. I could not do level 5 and the program wouldn't let me skip it. Robert Alvarez, the developer, sent me a hint. I got to level 9 which has a time element. After 10 times - maybe more - I did it. Level 10 is similar and I'm stopping there. Blinky's Escape is definitely fun and worth your time - especially if you like your puzzles to have an arcade element to it. The object is to connect the battery to the plane to charge it with connecting rods. On higher levels, you will need to deactivate electronic fences. There are 60 levels. On most of the levels, you can solve it multiple ways. However, you will need to have your rods get near the stars to earn full credit. 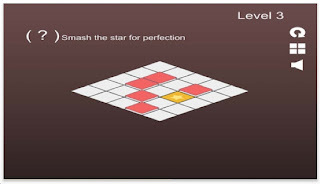 I solved the first 15 levels without getting all the stars. Then found out that I needed to collect them in order to move on to level 16. 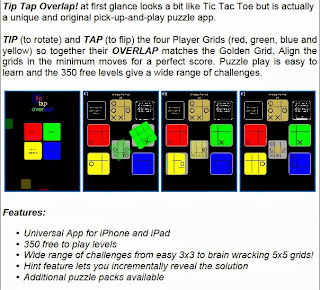 Level 22 was particularly interesting because it is actually a sequential movement packing puzzle. 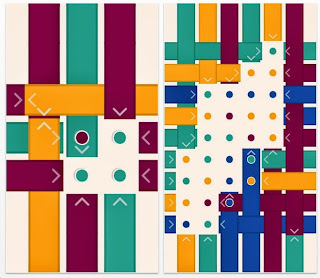 27, 29 are also a sequential movement puzzles. Right now I'm stuck in the 40's. Ehud Rosenberg, from Funtomic, likes #19 best. I should mention: the graphics and user interface are very good. No complaints at all. 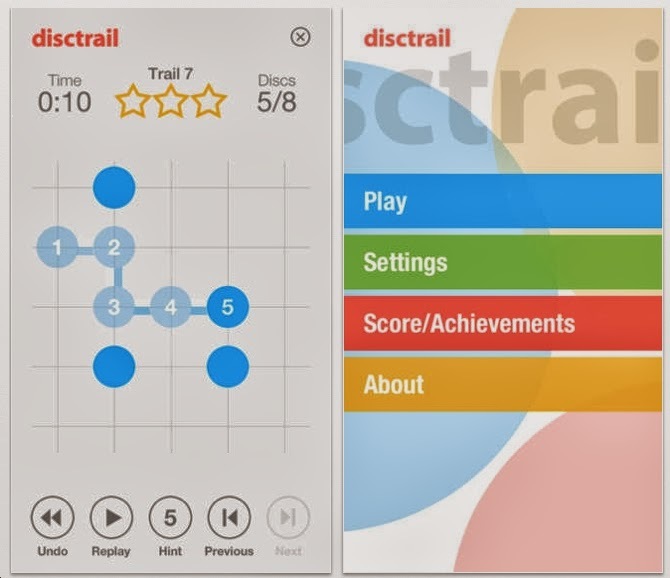 Stefan Carlsson recently contacted me about his new puzzle app game: Disctrail. It's a topology puzzle. 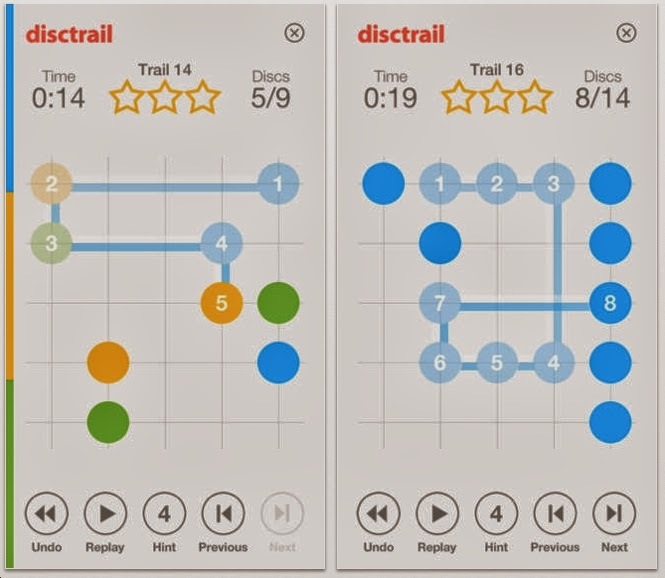 Object: start at any disc, and clear the board by traveling vertically & horizontally. 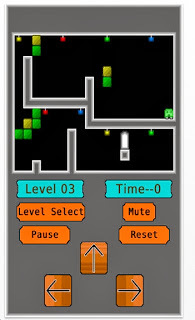 There are 16 free levels. I solved them all in about 15-20 minutes minutes. I must admit, I got stuck on a couple. Disctrail is a free puzzle app game with nice graphics. Give it a try. Chroma Dyadic is a point scoring puzzle app game. See the red circle? Tap on any square that's red to score points. However, all of those squares change their colors rapidly. If your red square turns blue and you tap on it - bad news. I actually like this concept. But this game just doesn't work for me. 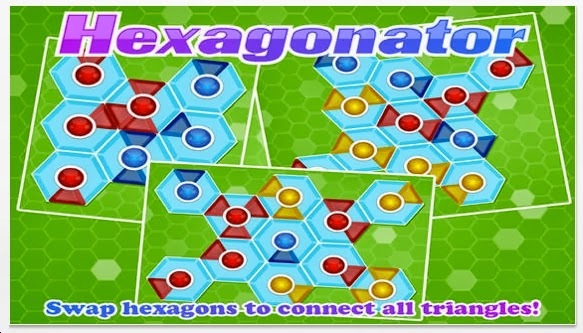 It's an edge-matching puzzle with hexagons. We've seen this type of puzzle many times before. 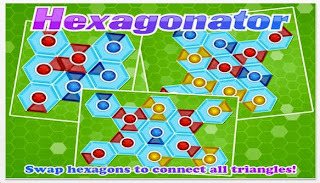 What makes this puzzle game a bit easier is that the individual hexagons do not rotate. This particular version has 25 levels. I played the game for about 30 minutes and solved 24 of them and got stuck on 25. It's trickier than I thought. I like the graphics and user interface. I like this game - it's easy, fast & fun. And I got stuck on 25. 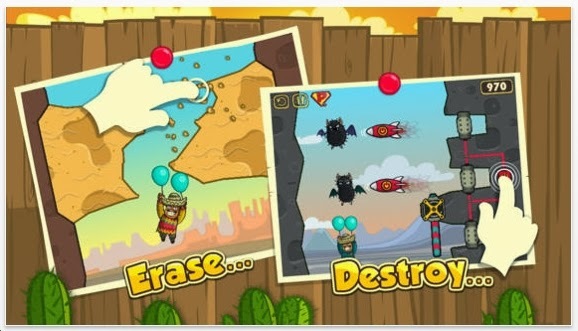 Yury Koshechkin is the CEO of Qaibo Games company and he recently contacted me about his physics puzzle app game called Amigo Pancho Free. 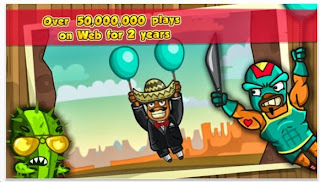 Pancho is holding 2 helium balloons. Tap on him to start his ascent. But first, you may have to manipulate some things above so he can travel safely. See images 2, 3, & 4 for examples. I'm not normally a fan of physics puzzles - because there are so many of them! Also, there's a lot of trial and error involved - especially with timing. I am more of a purist when it comes to puzzles. Nevertheless, I enjoyed Amigo Pancho! It's got a nice balance of challenge and fun. The graphics are good. When Pancho rises up, his feet sway. Cute? I don't know. Look at the first image: it says that it's been played over 50 million times on the web. I never heard of it, so I'm dubious about that claim. However, I always like promoters that inflate their popularity. Note: I never do that for this blog! 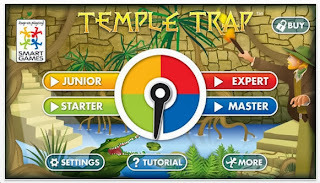 Do a search of 'Puzzle App' on google, bing, yahoo and this blog is always on page 1. Frequently, it is the first item. But I digress. Amigo Pancho is a mucho coolo winner. Everybody seems to be playing Candy Crush Saga. When a game is this popular, I'm always skeptical. Candy Crush Saga is similar to the many versions of Bejeweled. 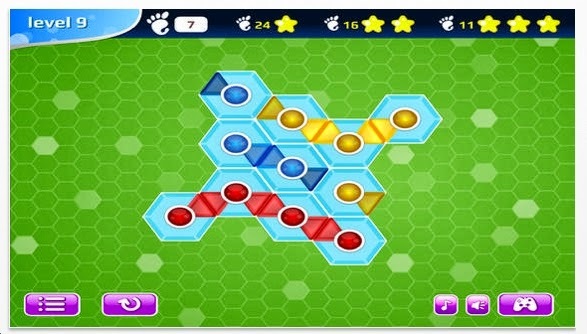 The object is to swap adjacent candies to create a line of 3 similar candies. They drop out, you score points, and new candies drop in. There are 425 levels. The objective for each level is a little different. I've played the game for several hours and just completed level 50. After failing it 5 times, I was locked out and told I could not play for another 30 minutes! Of course, I could purchase extra lives, extra moves, extra other things that would help. 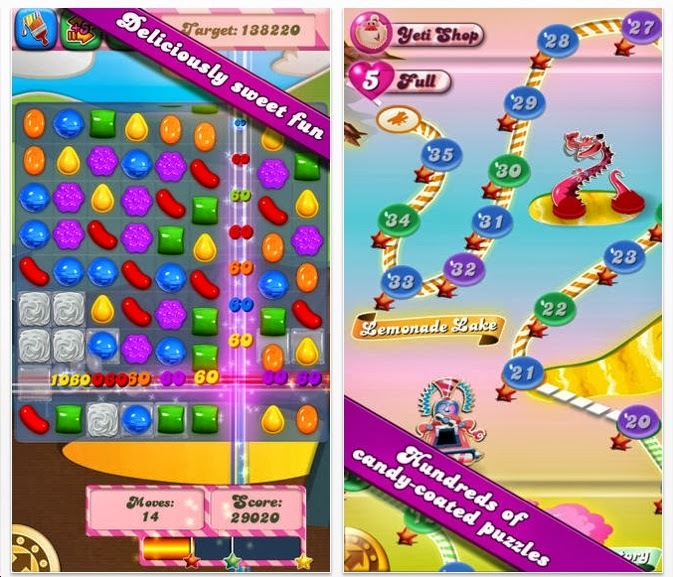 Candy Crush has become a money-making machine. People spend real money for these upgrades to feed their addiction. You cannot make a one-time purchase that eliminates annoying lockouts. I'm going to continue to play this game for another 10 levels or so. Because it is a good game. But there is little genuine variety between the levels. And I suspect something evil: I think that after you fail a level a number of times, the game presents an easy layout of tiles to keep you going. I'm giving myself a few more days, then will delete this forever. 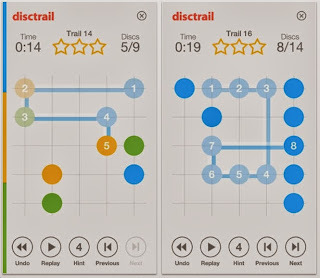 A much better game that uses a similar, but much more interesting approach is called Go Round. It's also designed to encourage people to buy things. But it's so much better done. And I'm proud that I solved the 100 levels without buying anything. My friend Raf Peeters is the brains behind all (or most) of the puzzles at Smart Games. He has invented at least 2 dozen puzzles. About a year ago, I asked him to please make them available for the iphone, and ipad. Temple Trap is a sliding block maze puzzle app game. The object is to get your Indiana Jones archeologist to the exit. When the archeologist is in a square - that square cannot move. Temple Trap has 110 levels. 13 are free. The rest cost $2.99. All of the levels are different from the physical version. Along the way, you can pick up coins and maps. 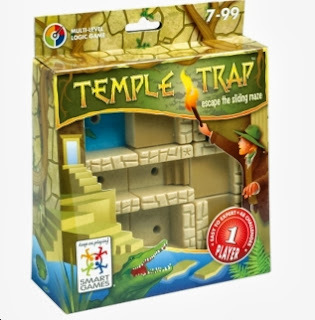 Most importantly: Temple Trap is challenging and fun! The physical version is an ideal compact size. Click here to purchase the real version. 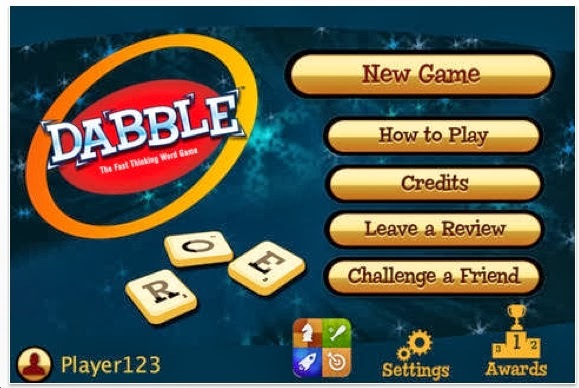 Dabble is a point scoring word puzzle app game that was invented by George Weiss who is 84 and a wall paper hanger. Look at the second image. 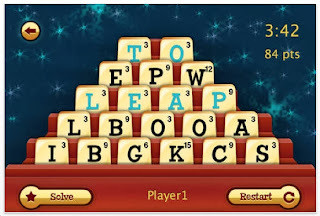 You must rearrange the tiles to spell a 6-letter word at the bottom, then a 5-letter word, then 4, 3 & 2. The quicker you do it, the more points you get. 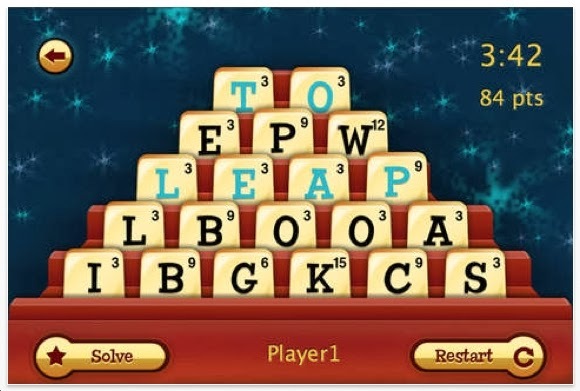 Also, you definitely want to use the higher point letters for the 6 letter word. My high score is 756. That's not too high compared to the serious word puzzlers out there. If you like Scrabble, Boggle and Bananagrams, you will love Dabble. My prediction: there will one day be a Dabble tournament where all the players are given the same sets of letters. Everybody will bring their ipad to the tournament hall and will download that day's Dabble Tournament App. 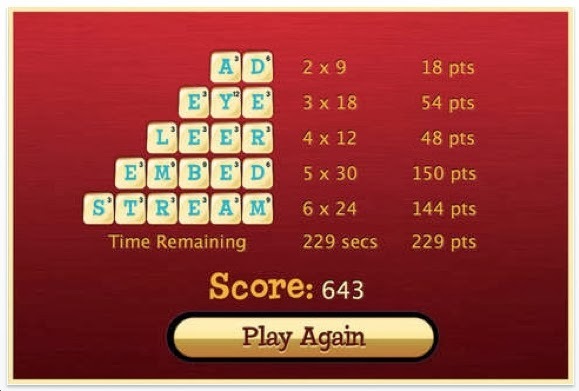 Unquestionably, Dabble is one of the best word puzzle app games of 2013. The Final List will be revealed December 30th and 31st. I never got into Pac-Man. But I love this rotating screen physics version. Right now it is not an ios game. 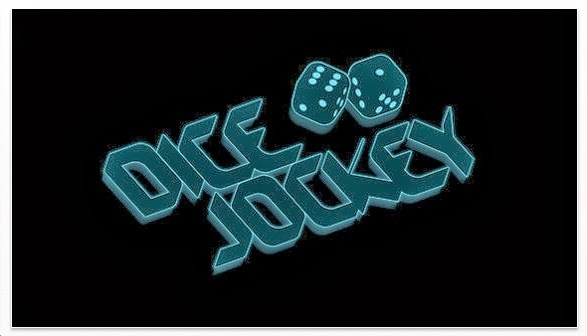 My friends John McCallion and Robin King write the reviews of new games for Games Magazine. They sometimes let me play-test the games. 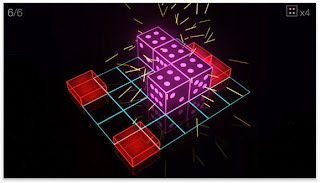 About 2 months ago I played Garden Dice. It's strategic and fun. And now it's been named as game of the year. Color Paper is a free puzzle app from Laurence Hillaireau. The object is to stack the papers onto 1 square. 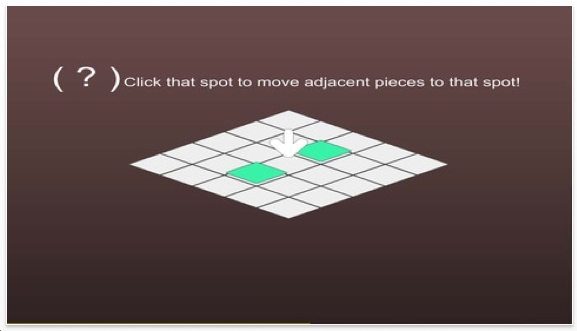 You do this by tapping an empty square that is adjacent to both squares that have paper on them. 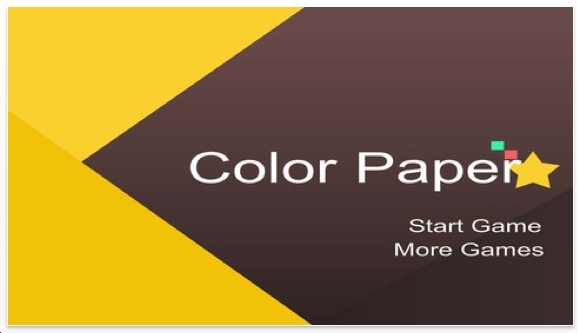 Color Paper has 30 levels and I've solved 16 of them and am stuck! Interesting concept. Worth your time. Woven is a new and very interesting puzzle app game. Look at the first image. 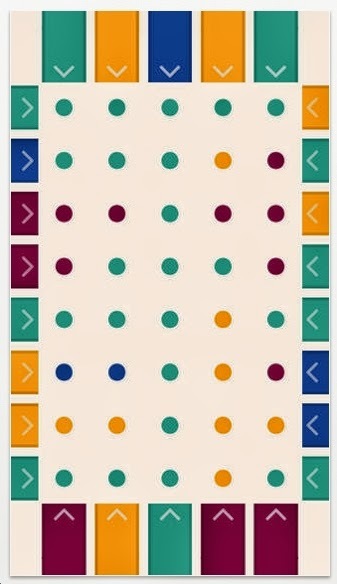 You must drag 2 ribbons onto each dot. The ribbon that is on top must match the color of the dot. 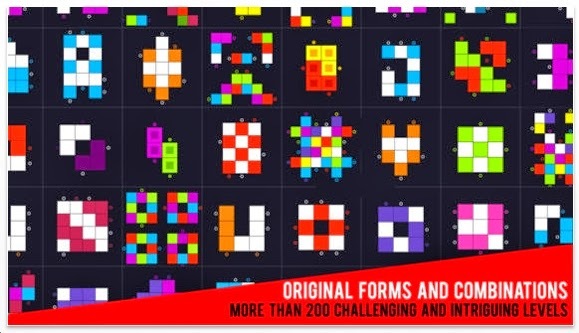 There are 200 individual puzzles. 96 of them are free. I've done them all. They took about 45 minutes.Once you get the hang of the concept, they go pretty fast. 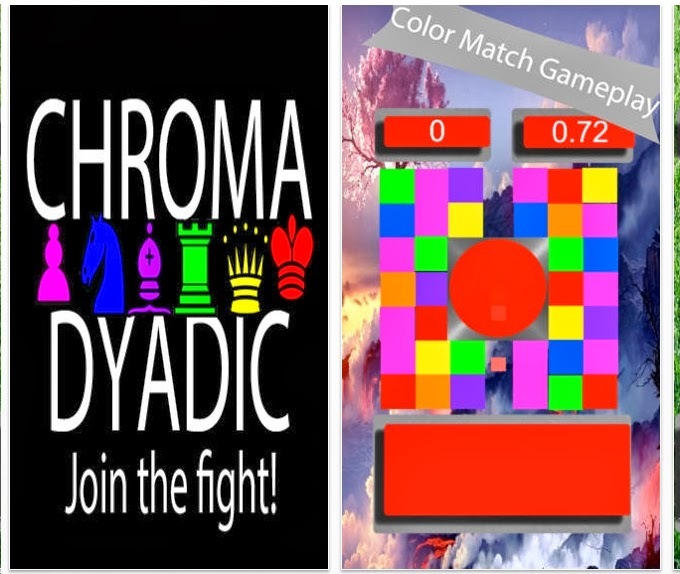 Another puzzle app game that uses ribbons is Color Bind. It's much more interesting and challenging. Still, give Woven a chance. It's fun. Puzzle friends, you have no idea how many emails I get about all sorts of puzzles. This one seems like fun, so I'm posting it. Would you do me a favor please? If you win some of that $5000, buy me a pizza. My name is Kelly and I’m writing from UrbanQuest. We make puzzle-based scavenger hunts that are found in almost 40 cities across North America. 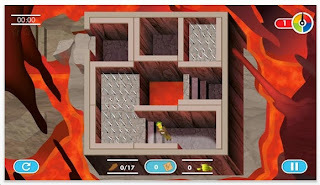 I’m emailing you to share a new puzzle project we’re launching called the EPIC Quest. We’ve dubbed it the biggest Internet puzzle in history. EPIC Quest is an online, interactive puzzle that will take place over 5 weeks with $5000 in cash prizing. There is an added component where winners will choose a charity to receive a donation equal to the prize money they’ve won (it’s our take on Celebrity Apprentice!). We are crowd-funding the campaign through Indiegogo, the world’s largest crowd-funding website. 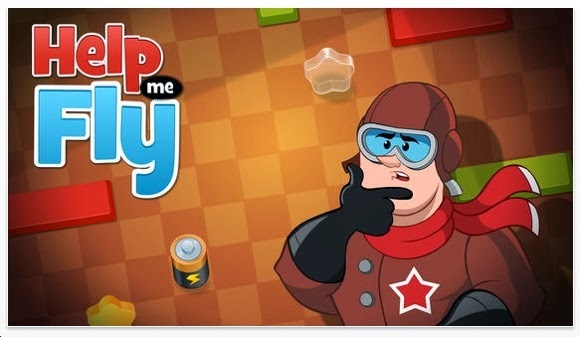 We’re reaching out to like-minded puzzle fans and we hope you’ll find this project interesting! If you feel so inclined, we’d be grateful if you would consider sharing it with your followers. Please don’t hesitate if you have any questions or feedback. And thanks! We’re just getting started so any help is greatly appreciated! 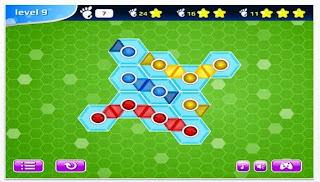 Hexpeg Solitaire uses a hexagonal grid. You must end up with only 1 peg and it must land in the black hole. When you do, you are given a time bonus. 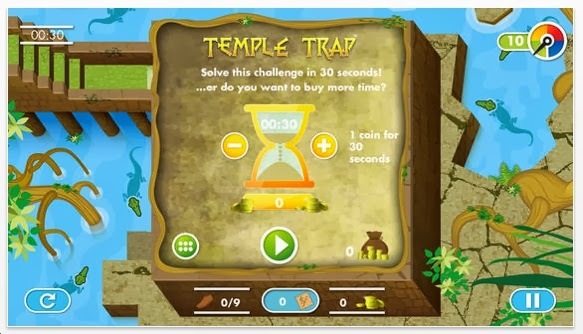 How many 'stages' can you complete before time runs out?